Hypertension( HT), high blood pressure (BP*) is a very common problem found in most of late middle age and/or obese individuals. There are two types of HT, primary/essential HT and secondary/correctable HT ( Caused by specific conditions e.g. adrenal gland disease, renal artery disease). Most common type is essential hypertension which is unknown cause. However if your family has history of one having HT, then you are at risk. HT is not curable but can be controlled. 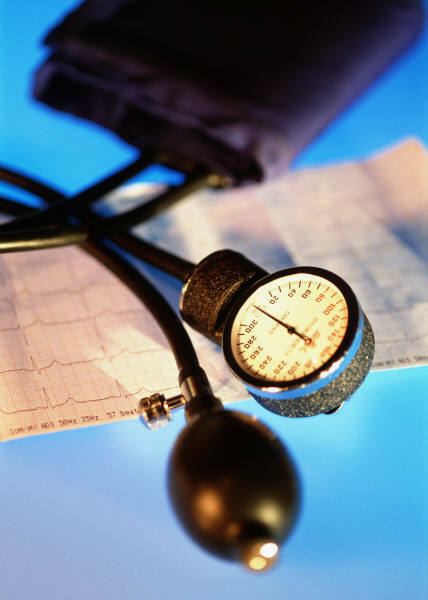 There are 5 recommendations by JNC7* to keep your BP under control. (1)Watch your diet. Eat low or no salt at all, no MSG, check on every single label on the food you buy from supermarket if it is MSG/salt free. (2) DASH eating plan (Dietary Approaches to Stop Hypertension) Change your diet with more fruits, vegetable and whole grain meals. Avoid high total and saturated fat products (Always check on the label). (3) Regular Aerobic exercise, for those whose joints are fine, brisk walk, jogging are good choices to lower your BP as well as your heart. For those with joint damaged, swimming is ideal exercise. One important thing, you must keep the exercise at least 30 minutes/session and at least 4 times a week to take an effect on lowering your BP. (4) Weight Reduction: This is difficult part, but it can be achieved easily if you practice the second and third recommendation regularly. Keep your BMI between 19-24.9 km/m² . Remember every single KG you lose means 1-2 mmHg less. (5) Moderation of alcohol consumption: If you drink, keep it in moderation e.g. 360 ml of beer, 150 ml of wine, 45 ml of whisky a day. If you smoke, quit smoking is essential and dramatically reduces risk of heart and stroke attack. If lifestyle modifications does not keep your BP below 140/90 mmHg or your BP is very high in the first place then pharmacological treatment is mandatory. Combination therapy ( e.g. water pill and ACEI, water pill&CCB) is better than monotherapy ( single medication) due to two different of mechanism on lowering BP is better than single action. Once your BP is under control, you doctor might try to step down your tablets. At this point you must keep practice the 5 recommendations seriously or you have to go back to bucket of tablets to keep your BP in optimal range. For further information please contact HCMC.